The best partition recovery software recovers lost, deleted, and formatted partitions for FREE. It easily recovers partitions that were lost due to virus attack, system malfunction, disk failure, or sabotage. Embedded with advanced partition recovery options, it has an easy-to-use and interactive GUI which is easy to understand. Recovery in Action – See How Free Partition Recovery Software Works! Whether the partition is lost due to accidental deletion or formatting, this partition recovery software facilitates the option to recover the lost partitions and the data stored in them. To recover the lost partitions, this partition recovery software offers Raw Recovery feature. With this advanced feature, the partitions are recovered by file signature without data loss. This advanced partition recovery software facilitates hassle-free recovery of data from Optical media devices, such as CDs, DVDs, HD DVDs, Blu-ray discs, etc. It also maintains the integrity of data stored in these devices. Email recovery is another beneficial feature that this partition recovery software provides. It can recover emails from various desktop email clients, such as MS Outlook, Outlook Express, and Lotus Notes. This free partition recovery software can recover data from FAT, NTFS, and exFAT file system based partitions. It does not matter whether the partitions were lost due to intentional/unintentional deletion or formatting. The partition Recovery software is efficient to recover deleted Office documents such as Microsoft Word, Excel, and PowerPoint. Scan the storage media to recover the lost and deleted Office documents. Audio Files WAV, AIFF, RPS, MIDI, MID, M4A, AU, OGG, WMA, AAC, RFL, RNS, RA, RM, MP3, M3D, CDA, AU, OGG, WMA, AAC, RFL, and SND. Video Files AVI, WMV, ASF, MP4, MOV, M4V, 3GP, MXF, MKV, MTS, DIVX, OGM, MOI, VOB, MPEG, MPG, AVS, DVM, QT, ANM, SMJPEG, SCR, FLC, CLK, ANI, FLA, SWF, FLV, and M4P. Image Files WBMP, DIB, PNM, NEF, CRW, CR2, ORF, SR2, SRF, K25, KDC, DCR, RAF, MRW, PEF, X3F, JPEG, JPG, TIFF, TIF, BMP, GIF, PNG, XCF, PAT, ARW, DNG, PSP, PCT, RAW, MOS, PSD, EPS, INDD, ERF, FH3, FH5, FH7, FH8 FH9, FH11, MCD, VWX, MEF, WP, CDR, CPT, VSD, DWG, PGM, PPM, PCX, MNG, MSP, WMF, WPG, EMF, ANI, NRW, TGA, and JP2. Database FilesMDB, ACCDB, MDF, DBF, etc. Miscellaneous FilesMHT, MHTML, ASPX, JSP, PHP, QDG, QSD, ABD, CBK, CAS, CHM, C, PRG, TEXT, CXX, HPP, XML, CC, HH, ASM, JS, PHP, ASP, LIC and DEF. Document Files DOC, DOT, DOCX, DOTX, XLS, XLSX, XLTX, PPT, PPS, POT, PPTX, ODT, OTT, ODM, ODS, OTS, ODP, OTP, ODB etc. How to recover lost or deleted partitions? Download and install the partition recovery software. Run the software and choose the type of data to be recovered from ‘Select What to Recover’ screen by placing a checkmark on the desired check boxes. Click on the ‘Next’ button. Select ‘Can’t Find Drive’ from ‘Select Location’ screen by checking the respective checkbox. After completion of the scan, ‘Select Hard Drive to Recover Lost Partitions’ shows up. In the Select Drive section of the interface, all connected drives are listed with details. Here, choose the drive to scan for lost partitions and click on Search option. The software then searches for the lost partitions. All lost partitions detected by the software are enlisted in the ‘Partitions Found’ section. From here, choose the partition you wish to recover and click on the Scan button for the continuation of the scan process. How to find a specific file format in the list of supported formats? Run the partition recovery utility by giving double-click on its icon. Click on ‘Settings’ tab that is present on the tool bar. Then, select the ‘File List’ tab. A ‘File List’ screen that contains all supported file types is displayed. Choose the desired file types and proceed with recovery process to find files of specific types. If the desired file types are not present in the list of supported file types, you can add more file types in the ‘File List’ screen. You can do so by clicking on the ‘Add File Types’ tab. Can I use this software free for a lifetime? You can use this software free for a lifetime but only to recover a maximum of 1GB data wherein the file size is 25MB or less. How to recover the inaccessible partition from the damaged MBR disk? Disconnect the damaged hard disk from your PC (if possible) and attach it to another Windows PC that has this partition recovery software installed on it. Then, you can run the software and carry out the defined process to recover inaccessible partitions of your damaged disk that is now connected as an external drive to another PC. What is partition recovery and why it is needed? A partition is a component of the hard drive that has fixed storage capacity to store data. Every partition is allocated a particular letter, such as C, D, E, and so on. Every partition has file systems linked with it. They are FAT, exFAT, and NTFS. These partitions can get lost because of deletion, formatting, or reinstallation of OS. In such situations, partition recovery becomes essential. Partition recovery is a must in such situations as it helps users to recover lost partitions and the data stored in it. Moreover, you can use the partition recovery software to restore photos, audio, videos, documents, emails, database, backup or any other file that were lost. Last but not the least, it can also recover NTFS, FAT, exFAT partitions. Can I recover specific partition by the help of the software? Yes, you can recover specific partition by the help of this software. The software is taking a long time to scan my drive, what can I do now? If the software takes a long time to scan, check whether Deep Scan in ‘Select Location’ screen and the Preview feature in the Scan screen is turned ON or OFF. If they are ON, turn one or both of them off to speed up the scan process. I see two scan methods: Quick & Deep, which one should I try first? From the two Scan modes: Quick and Deep, you should try Quick Scan first. If you find the desired data or partition in the Scan results, you do not need to try Deep Scan. However, if the desired data or partition is not found in the Scan result, you should go for Deep Scan. I still don’t find the solution to my query. Whom should I contact? If you still do not find the solution to your query, you can contact the Technical Support team which is available 24*5. 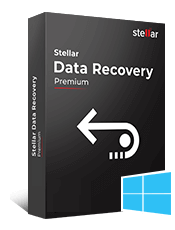 Stellar Partition Recovery tool is an excellent software which supports all kinds of storage media for data recovery. Thanks to this magical partition recovery tool, I recovered my school presentation from Optical Media i.e DVD. Thanks to excellent support from Customer Case team, the partition which is earlier not accessible is recovered using Deep Scan mode of software. 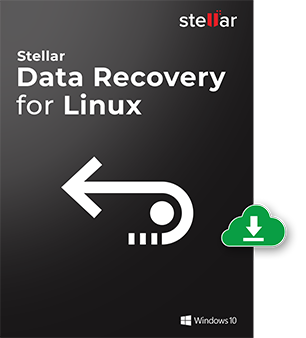 Stellar Partition recovery program is impressive for lost data recovery from most storage media devices. The software performs lost partition recovery very well in Windows 10. One of the finest data recovery software to recover data from SD Cards, HDD, CD/DVD's. Easily able to recover my deleted partition with the help of Stellar Data Recovery tool. Nice interface. Don't find any difficulty in retrieving data from Seagate HDD. Fast, Secure and Reliable! The tool fully retrieved back deleted partition. Happy with the product's performance with excellent customer support. One of my favorite partition recovery software which I ever used being an IT Technician. Best Windows partition recovery tool for Windows 10/8/8.1/7/XP. Great Show by Stellar Data Recovery software for retrieving lost files. Satisfied. Best data recovery software till date for NTFS partition recovery. I was surprised to found that even a data can be recovered from scratched CD. One of the best software for data recovery from cd. A great smile on my face after viewing the lost images and videos on Preview Section. It took 35 minutes to scan & recover data from my HDD & after recovery of data I was able to open and view data in it. 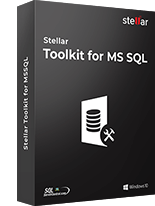 The best software for recovery of data. In the hard times of data lost. 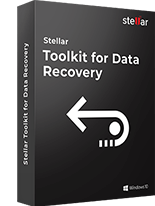 Stellar data recovery software comes up as a warrior recovery software for me. All my official files are recovered back after recovery process. 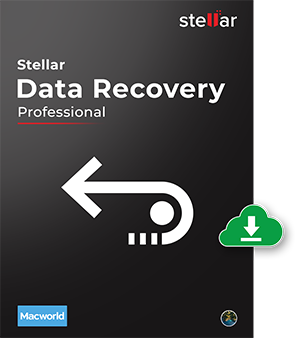 We have used the stellar professional version and there is the complete in depth review on my site about how to use this software for data recovery. I recovered data from my scratch CD and from recycle bin. Thanks! It was not possible to recover my data from the fast formatted HDD (extern USB Drive) using other tool. But, with this tool, I was able to recover about 99% of my lost data. You guys tried to help me, so appreciate it, and when you couldn't, you issued a prompt refund. Will always recommend your company and won't hesitate to try again next time. Thanks I was able to recovered my lost data & files. easy to use GUI with powerful recovery algorithm. Pre-Recovery preview of lost or deleted files is really appreciable. When I almost lose all hope for formatted data recovery. This software not only show the preview of data but also recovered complete data. Being a journalist I always carry multiple storage devices for storage purpose. Frequently deals with data recovery problems due to the formatting of sd card and external hard drives. Good to know that Stellar data recovery software retrieves data from all the storage devices. Overall, I rate Stellar with 4stars out of 5 with its user friendly interface and easy to operate procedure when recovering files and like from other recovery tool that I have tested so far it can manage to retrieve those deleted files and formatted drives and sdcards as well. I love your products they are extremely useful for data recovery and the success rate has been 100% to date. Thanks for creating such effective products, you provide me a reliable solution to best serve my customers! After a stupid formation I´m so happy to get it back by all former names of files - thank you. Its a great softwarre. It immediately recovered my files from Pen drive. Although My data was not too much, BUT it was very important to me. Thumbs up for Turn On-Off Preview feature. Product wad a little pricy but recovered all lost data. Slow a bit. Successfully recovered all the deleted musical files from my external Seagate hard drive. If you upgrade, try to make upgrades free or at a reduced price for those with existing license. 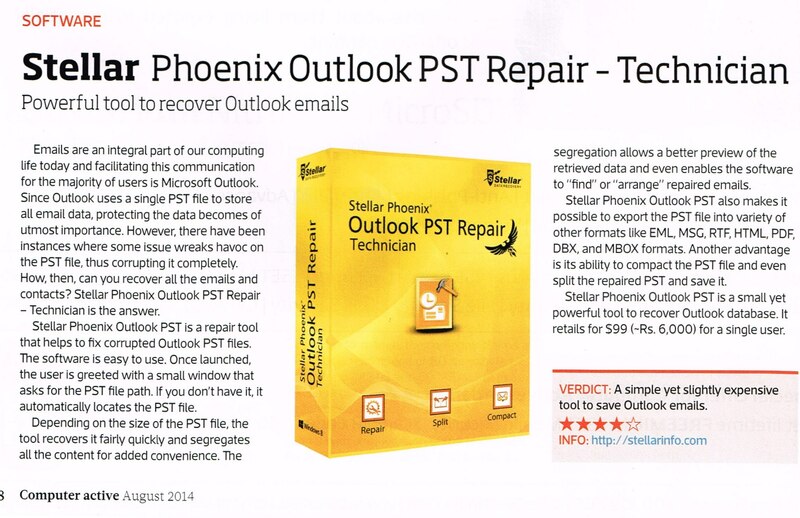 Smart and professional utility to repair corrupt or inaccessible Microsoft Outlook PST file. I am pleased to report that the data was in fact successfully recovered. I purchased the software as a last ditch attempt to recover data from a .pst file for a very distraught client, and wasn't holding much hope, when to my joy all the data came through! 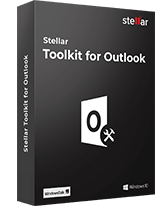 Simple yet powerful tool to recover and save Outlook Emails. I had not backed up my Outlook pst file and when my hard disk crashed I thought I had lost everything. 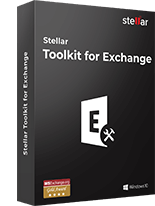 Scanpst.exe could not get into the file Stellar PST Repair got my mails back.